The Israel Institute of Bible Studies has partnered with the Hebrew University of Jerusalem, the leading academic institute in Israel and one of the leading biblical research institutes in the world. We aim to share this wealth of knowledge with people around the world through programs developed by our leading biblical scholars and education professionals, and through our many years of experience as the leading online institute of biblical studies. People who are passionate about the Holy Scriptures are interested in the deep meaning that is found in the Bible's texts, land, people, language, and culture. 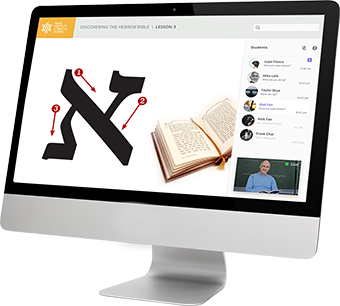 In the Israel Institute of Biblical studies, you will find online courses and educational programs that cover the full spectrum of biblical knowledge taught by the world's top scholars and experts in the studies of the New and Old Testament. Our supportive and social learning environment ensures that students are academically challenged through the in-depth study of the Bible. Join today the world's largest institute of biblical studies and become a Bible expert. Learn to interpret the holy texts, while discovering the ancient land of the Bible where the stories took place. Leave your details and an academic advisor will contact you with information about the content of the courses, tuition and schedule. "I can only say I'm enjoying it immensly!" "I enjoy the multinational classrooms with Hebrew speaking teacher & his great sense of humour. Very skilled teaching." Dr. Ohad Cohen was a linguistics researcher at the Hebrew University of Jerusalem and he is now a Faculty Member at the Department of Hebrew Language, University of Haifa. He teaches Biblical Hebrew, Biblical Aramaic and Hebrew Phonetics.